I know I keep telling you this, but I love my slow cooker! Especially when it involves easy recipes like this pulled BBQ Chicken, where there are minimal ingredients involved and I can just dump them in and have a tasty meal 6 hours later. I was also excited to use some Stubbs BBQ sauce that I picked up on our trip to Austin. This recipe is very similar to the Pulled Buffalo Chicken, just without the buffalo flavor. I'm a huge BBQ fan though so I had no problem devouring this version. Both the Buffalo and BBQ versions of this recipe would be an easy dish to add to your Super Bowl spread. 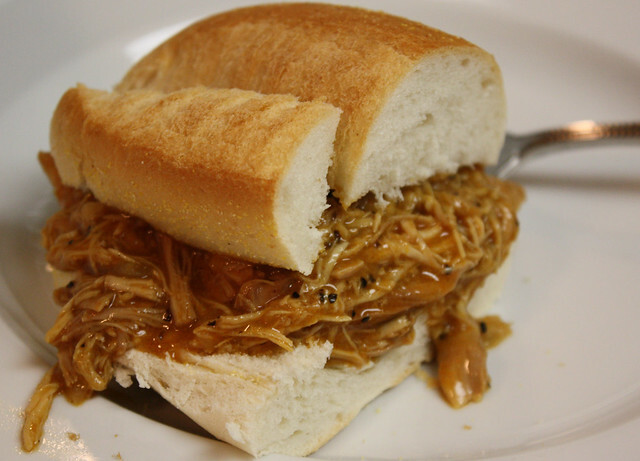 You can serve the chicken on sliders for an appetizer or on regular rolls to make it a main meal. Next time I plan on making a BBQ Chicken Pizza. And you can of course always serve it straight up, BBQ style. If you are making this for a large crowd you might want to up the quantities a bit, depending on how many people. This made enough for about 8 sandwiches. And if you haven't already, befriend your slow cooker. Place all ingredients in the slow cooker and stir together. Cook on low for about 6 hours. Shred chicken, as I've mentioned before a potato masher works great for this. Taste chicken and add salt or pepper if desired. Also stir in more hot sauce if you want to turn up the spice. If making sandwiches, use slotted spoon to place onto rolls and then spoon more sauce on if desired.